Shukon is one of Tamanohikari’s classic Sake that embodies the delicious flavor of the main ingredient—rice. 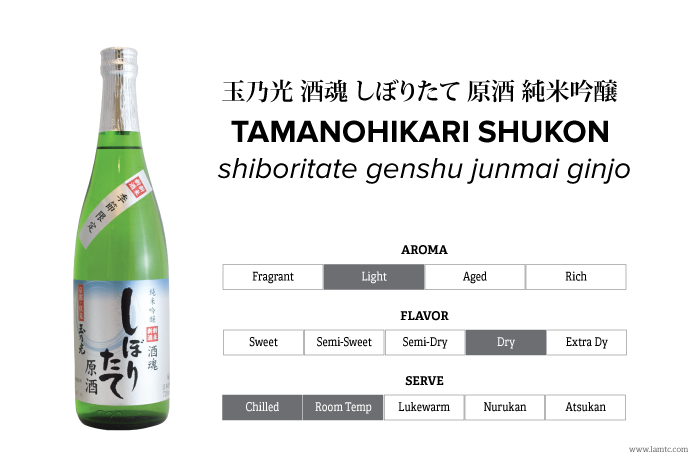 Among that, this Junmai Ginjo Shukon is available only during the winter as the freshly pressed undiluted brew is bottled immediately at the beginning of winter season. A special brew with a distinctly unique richness of genshu and sharp acidity that finishes with a refreshing note. Limited quantity –give it a try before its gone!